Continuous Line Drawings at “British Wildlife” Exhibition, Martin Mere. “British Wildlife” Exhibition, Martin Mere, February & March 2015. Mick Burton, Continuous Line Artist. This is my second year taking part in the Association of Animal Artists exhibition at Martin Mere Wetlands Centre, Lancashire. “British Wildlife” runs until 29 March 2015. My chosen wildlife submissions are “Mouseman Mouse and “Gledhow Foxes Sunbathing”. My grandad George Burton was born in Kilburn, North Yorkshire, and when I was young my Dad took me to the Church in Kilburn and pointed out the carved mice which appeared on the church furniture. They were carved by Robert Thompson, who was at school with Grandad, and his family still run the furniture business in Kilburn which is now world famous. 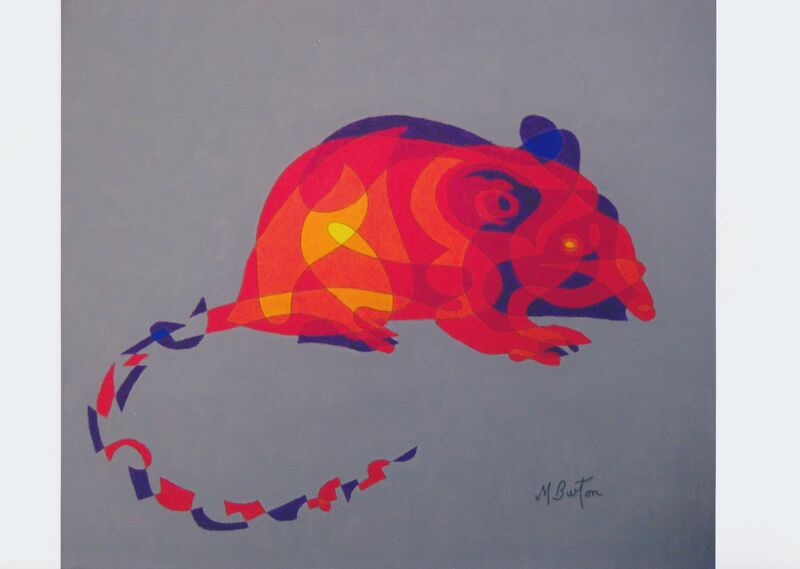 As time went on I found out so many things about Robert “Mouseman” Thompson and his mouse trademark. It seemed natural that I should do a mouse in my continuous line drawing style and colour sequence. Robert “Mouseman” Thompson’s trademark carving on the Altar rail in Kilburn Parish Church, North Yorkshire. Picture by Dave Sumpner at English Wikipedia. Dad told me that Grandad and Robert were drinking companions in the late 1890’s and he passed on some stories of those times. A man went to the pub in Kilburn with his groceries every day before setting off home. He always went home over the “beck” footbridge, which had vertical rails with strappings through them. The man habitually stopped half way across, sat on the straps and lit his pipe. Grandad and others loosened the straps one day and the man later fell into the water. There was a lot of “fuss” about that. Another regular at the pub always parked his horse and trap outside and, of course, regardless of how much he had had to drink the horse could find its way home. One night he came out of the pub and boarded the trap, not realising that the horse had been turned around between the shafts. He drove off backwards to crash into the church wall. I attended a talk by one of the Thompson family over 40 years ago in Leeds Central Library and spoke to him later. He said that each wood carver had his own style of mouse. Old Robert’s mouse had become very simple, like a wedge of cheese, and they called it “grand prix” mouse. “Gledhow Foxes Sunbathing”. Association of Animal Artists “British Wildlife” exhibition, February & March 2015. 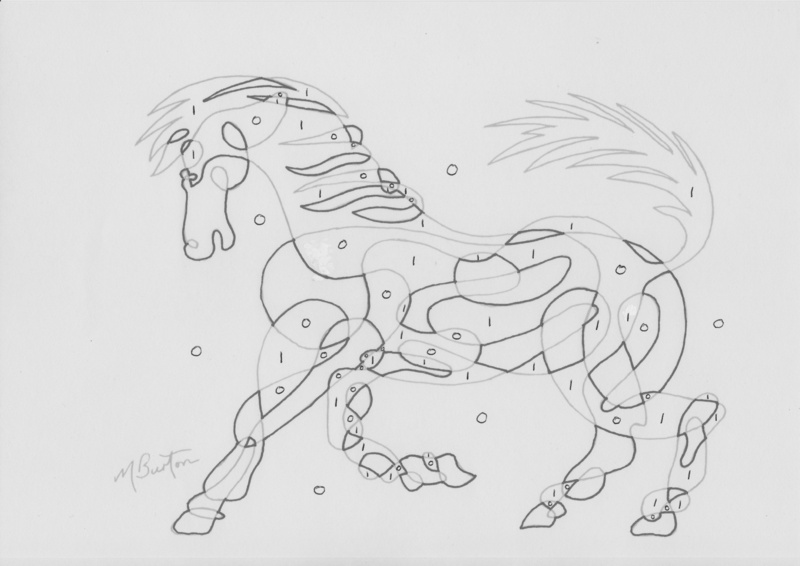 Mick Burton, Single Continuous line drawing. I saw a fox cub at the east end of Gledhow Valley Woods when walking the Airedales over 30 years ago. Since moving here foxes have regularly been in the garden in the day time. Last summer they took up sun bathing at the top of the lawn virtually every day for a period. This usually included a prolonged period of scratching. When we were completing the patio, with the help of Helen, Janet and Richard, a fox came and sat at the top of the garden and watched. He had the demeanour of an “overseer” or a General overlooking a battle. On another day there were two of them sitting up there and they reminded me of the “King and Queen” sculpture by Henry Moore which I saw up on the hill at Yorkshire Sculpture Park in 1987. 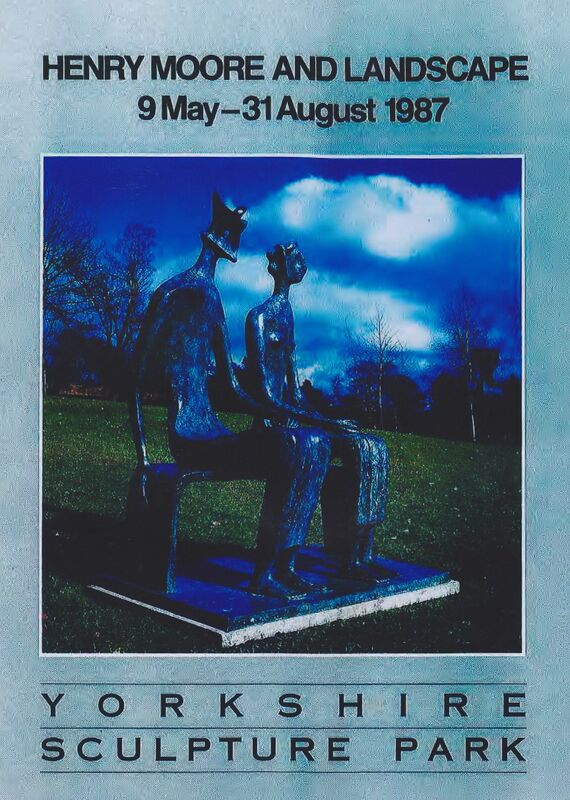 Poster for Henry Moore exhibition at Yorkshire Sculpture Park, 1987. 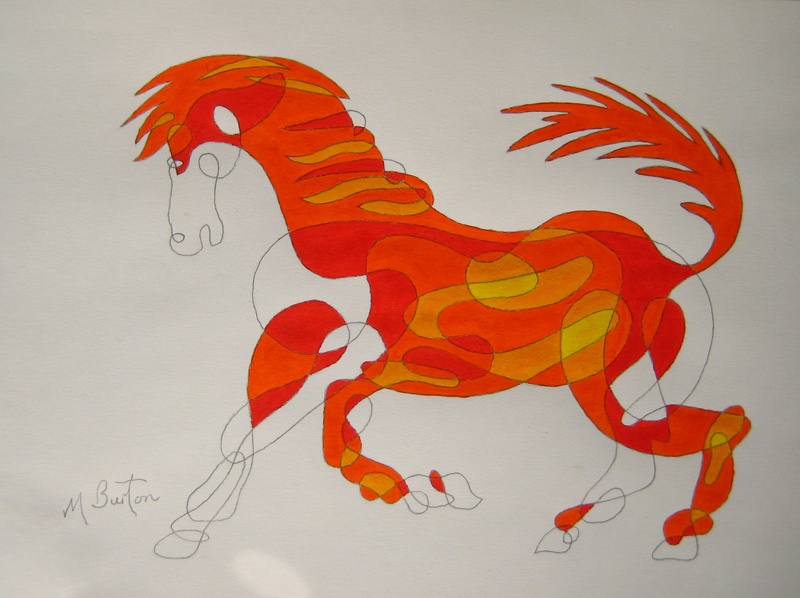 Continuous line blog by Mick Burton. This entry was posted in Animals, Exhibitions, Famous Artists, Gledhow Valley Woods and tagged Airedales, Association of Animal Artists, British Wildlife, colour sequence, Continuous Line, continuous line blog, Continuous line drawing, Fox, Foxes, George Burton, Gledhow, Gledhow Valley Woods, grand prix, grandad, Henry Moore, Horse, Kilburn, Kilburn church, King and Queen, Martin Mere Wetland Centre, mick burton leeds artist, Mick Burton Yorkshire artist, Mouse, Mouseman, Robert Thompson, wood carver, Yorkshire Sculpture Park on February 18, 2015 by mickburton2. Show me a real Green Cat. Cat who slept on a heap of old green paint. Daily Mail, December 5, 2014. 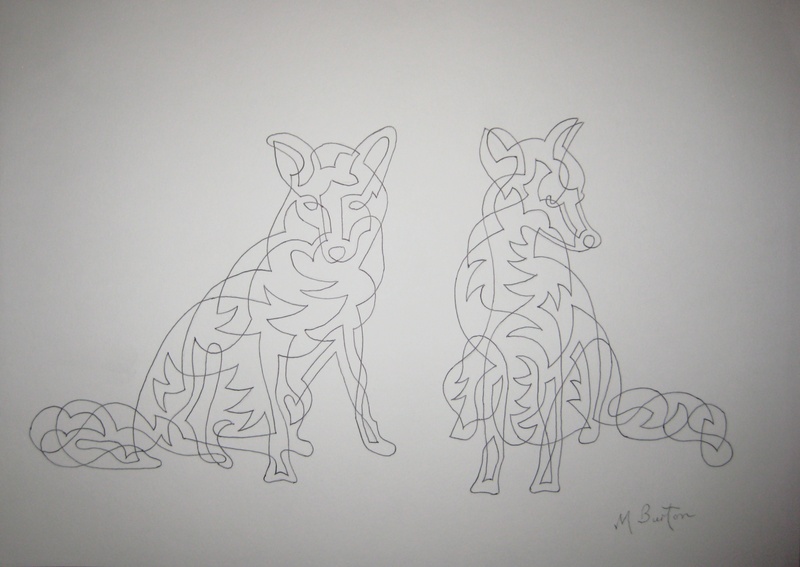 Mick Burton, continuous line drawing. 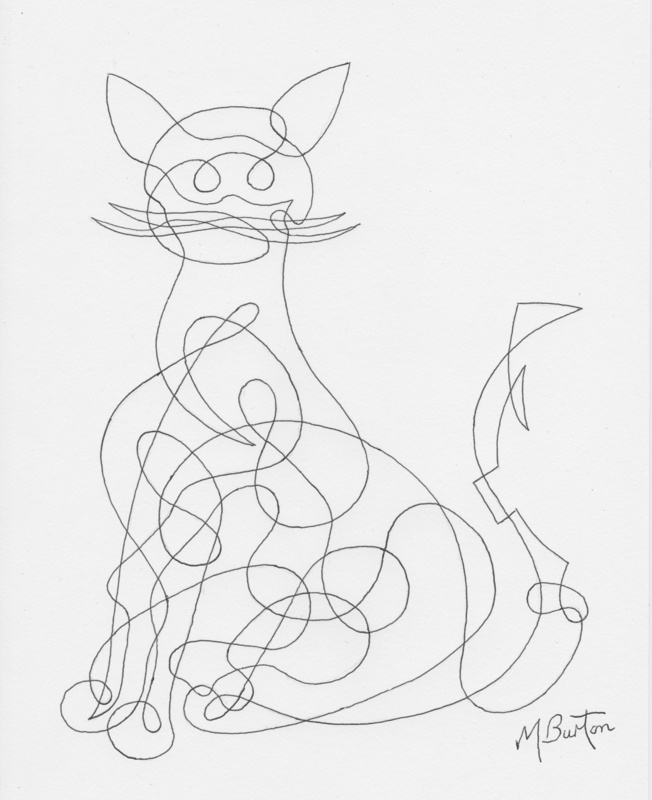 I always thought that Green was a natural colour for a cat done with my continuous line drawing, but I never realised that one would appear. Here we are, in the Daily Mail report on a cat who is actually green and wandering around quite happily. 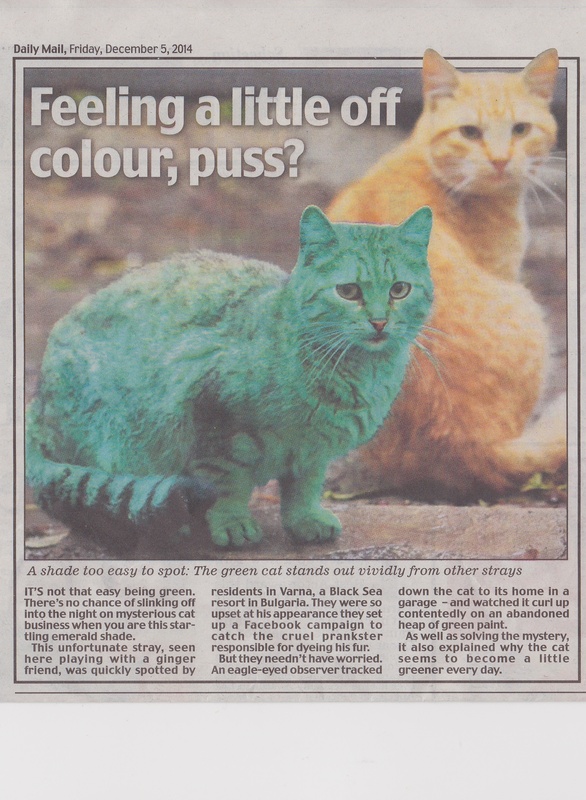 It turns out that the cat slept in a garage on an abandoned heap of green paint. My original Green Cat was created in 1969 as one of four animals sold to J Arthur Dixon Ltd., a greetings card company that was based on the Isle of Wight. They produced sets of Notelets with them on, sold in little cardboard boxes. Here are the four designs. 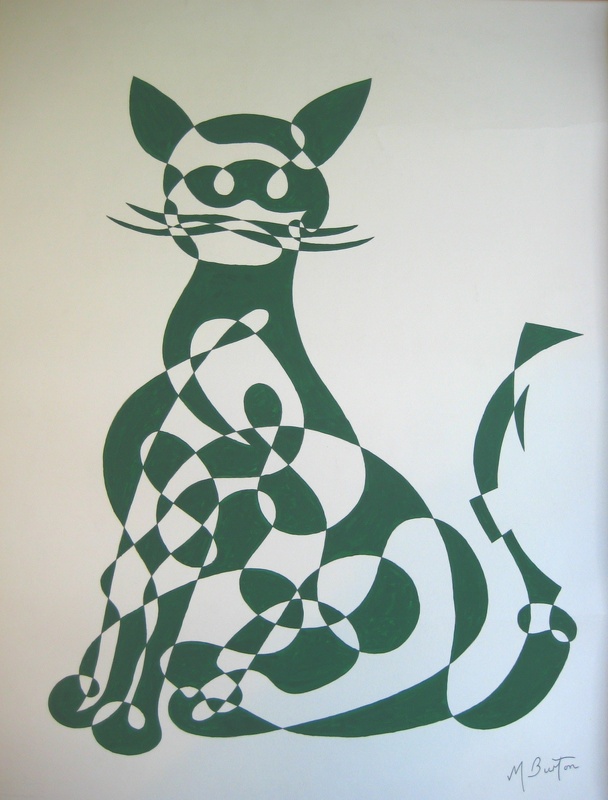 Green Cat, single continuous line drawing and alternate shading, by Mick Burton. Notelet design for J Arthur Dixon Ltd, Isle of Wight, 1969. 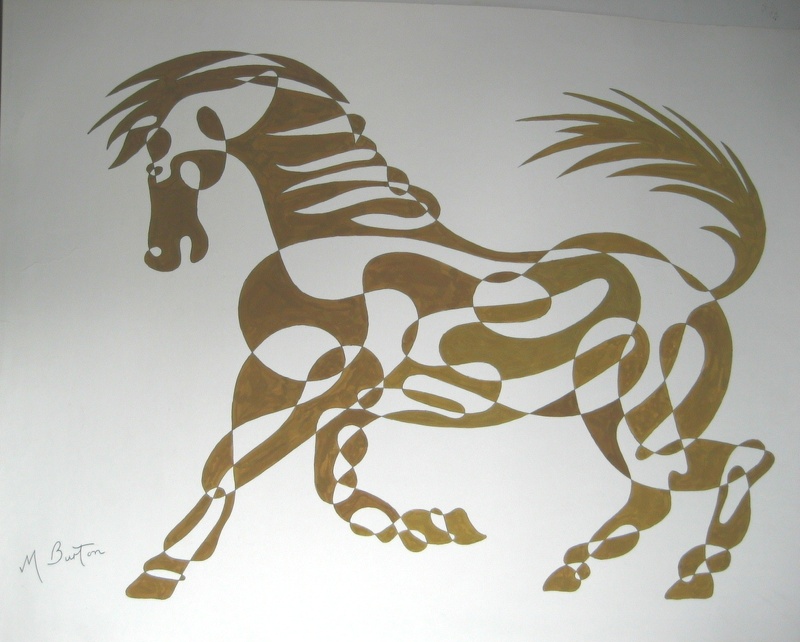 Golden Horse, single continuous line drawing and alternate shading, by Mick Burton. Notelet design for J Arthur Dixon Ltd, Isle of Wight, 1969. 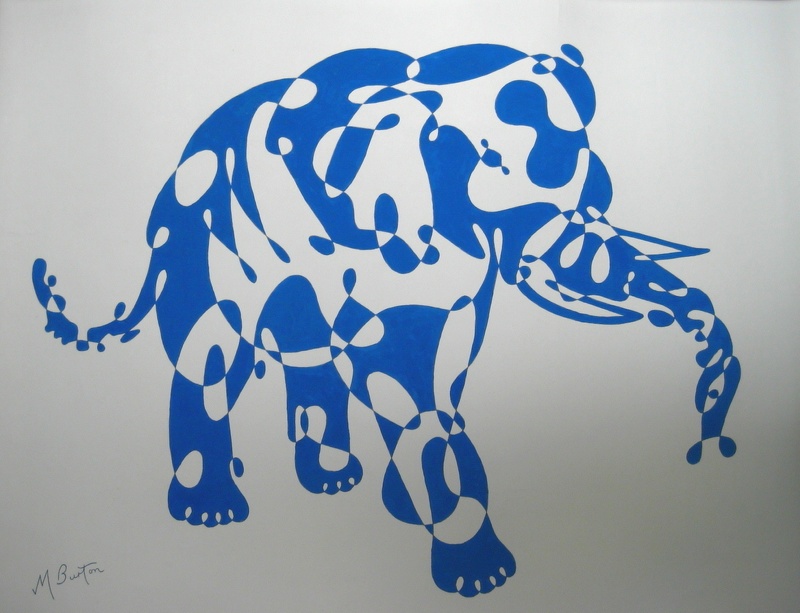 Blue Elephant, single continuous line drawing and alternate shading, by Mick Burton. Notelet design for J Arthur Dixon Ltd, Isle of Wight, 1969. 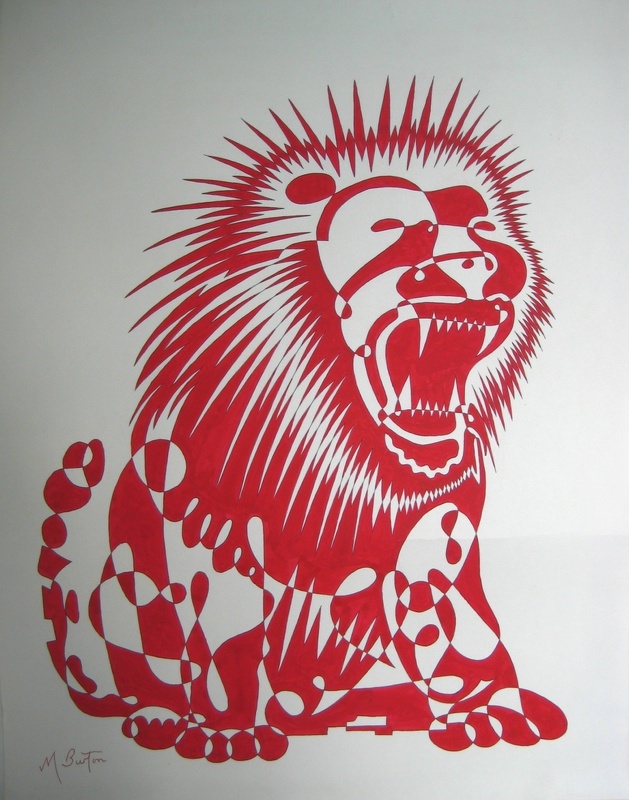 Red Lion, single continuous line drawing and alternate shading, by Mick Burton. Notelet design for J Arthur Dixon Ltd, Isle of Wight, 1969. I continued the Green theme for a cat when I started producing my own greetings cards in 2013. This time I used colour sequence from yellow, through greens to blues. 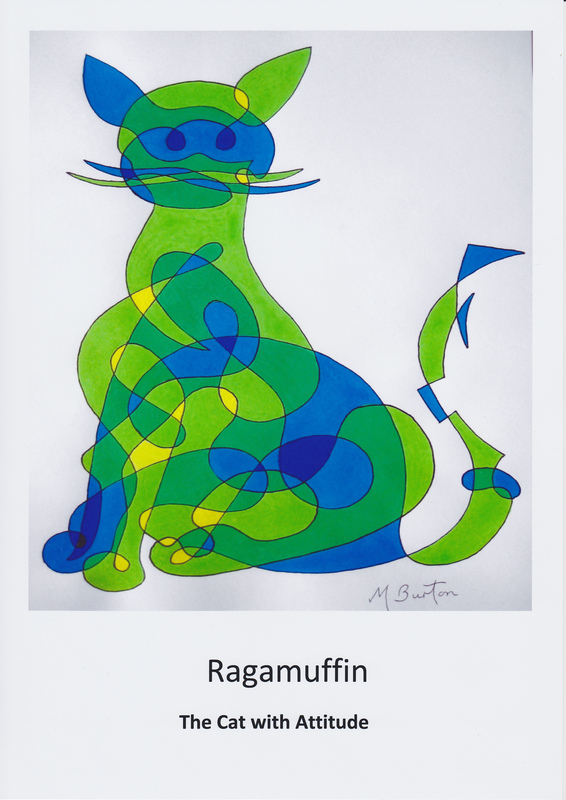 Ragamuffin, single continuous line drawing with alternate shading. Rear of Greeting Card by Mick Burton. 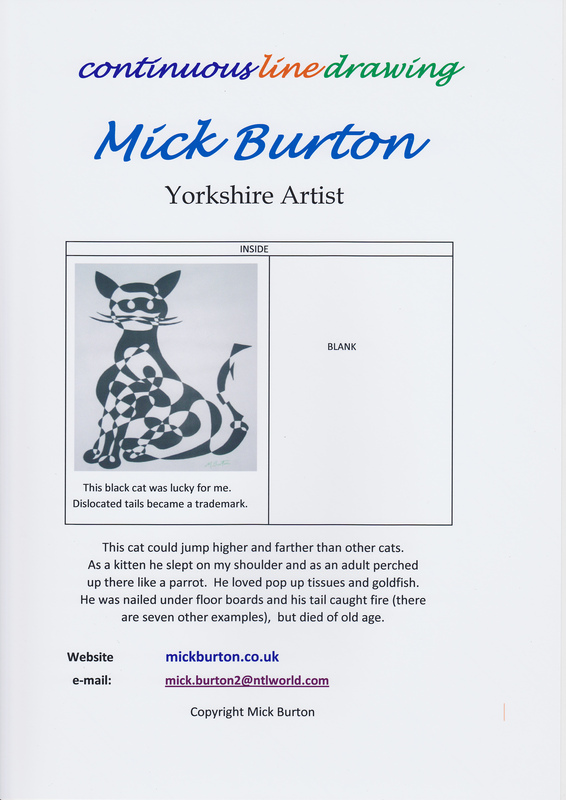 This entry was posted in Animals, Greeting card and tagged Alternate shading, Cat, cat with attitude, colour sequence, Continuous Line, Continuous line drawing, Daily Mail, elephant, Green cat, greeting card, Horse, J Arthur Dixon, Lion, mick burton leeds artist, Mick Burton Yorkshire artist, natural colour, notelet, Ragamuffin, Sandy the cat on January 12, 2015 by mickburton2. After my early attempts at continuous line drawing, and then alternate shading, I tried Alternate Overdraw on top of my continuous line drawings. 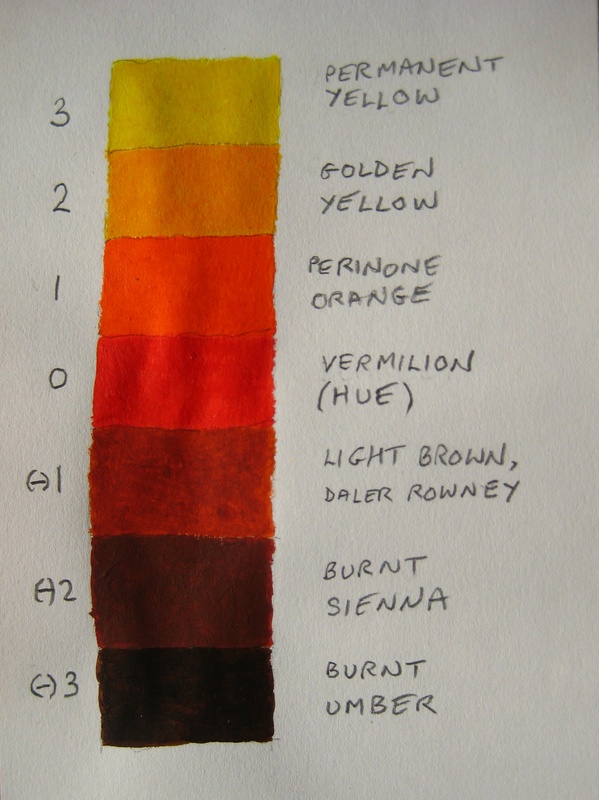 This produced some fascinating results which led to developments throughout my art. Draw from A to B to start Alternate Overdraw on Single Continuous Line Drawing of the Horse. Lets use the Horse as an example. Here is a lightly drawn Continuous Line (sorry if you have to tilt your lap top to see it all). Start at point A and use a thicker pen or marker and draw over the first section of line, in the direction of the arrow, between the two crossovers. Then miss a section before overdrawing the next section of line. Keep going overdrawing alternate sections to point B. You will see that already some overdraw sections are forming closed lines. 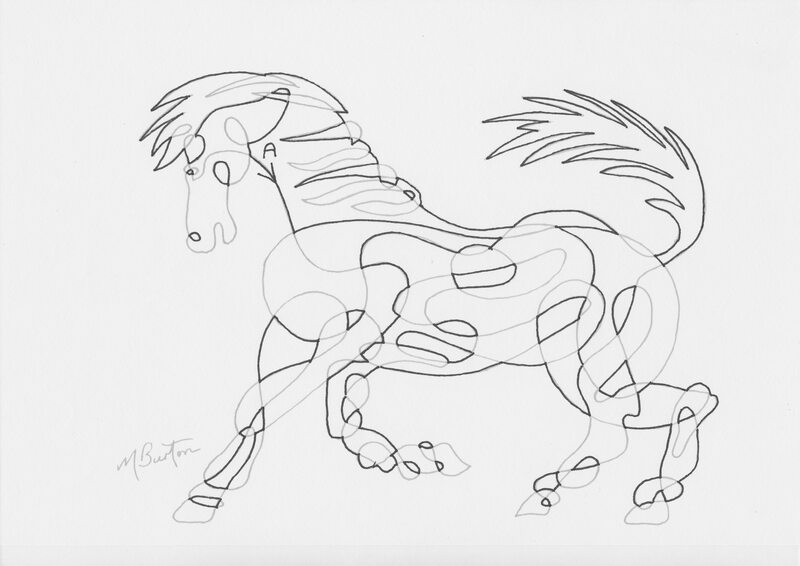 Complete Alternate Overdraw of Continuous Line Drawing of horse from point A. The next illustration shows the complete Alternate Overdraw and all these new darker lines form closed lines. Naturally, if we start the Alternate Overdraw in a section which was not overdrawn in the above example (eg at X below), then this produces a result where a completely different set of closed lines appear. 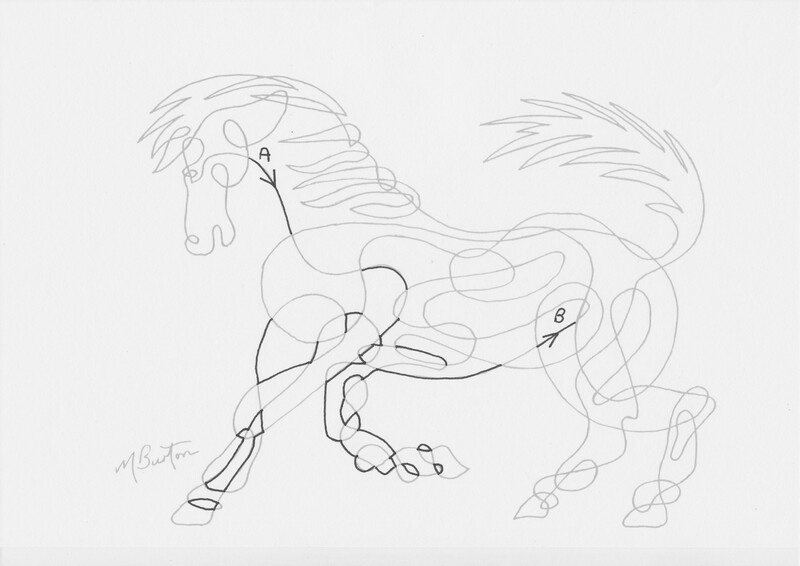 Other Alternate Overdraw on Single Continuous Line Drawing of horse, starting at X. From the above findings I first developed my Colour Sequence ideas, which I will expand upon in the next post. Later I used the closed lines to help in the construction of large models of my continuous line drawings as well as to devise hidden drawings within continuous lines. More later on those. 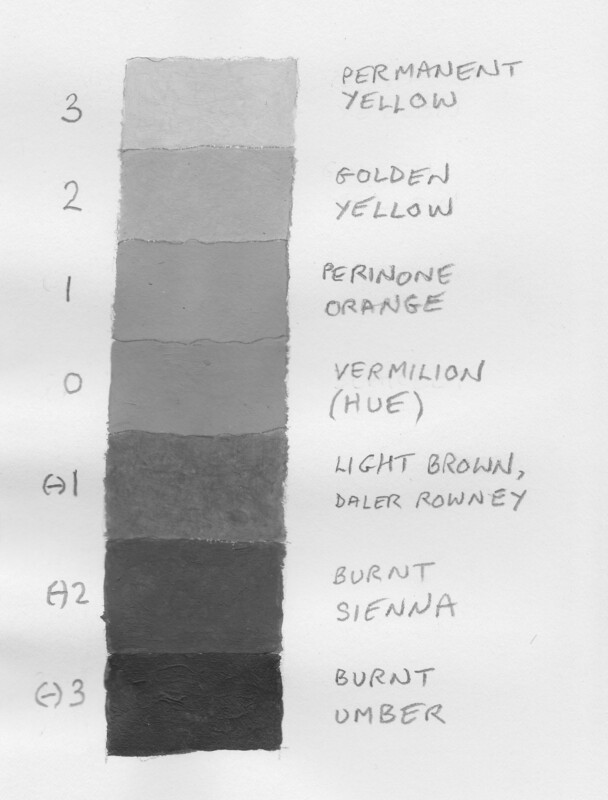 The Alternate Overdraw method also led to a way to find a path through Four Colour Theory maps as part of my attempt to prove that theory nearly 40 years ago. So, watch this space !! 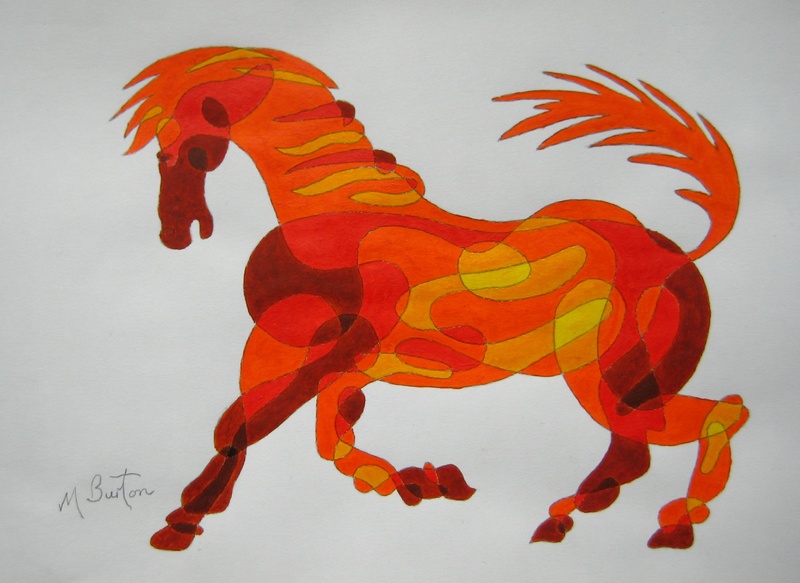 This entry was posted in My Styles of Drawing and Colouring and tagged Alternate Overdraw, Alternate shading, closed line, colour sequence, Continuous Line, continuous line construction, Continuous line drawing, crossover continuous lines, Four Colour Map Theorem, hidden drawings, Horse, mick burton leeds artist, Mick Burton Yorkshire artist on September 10, 2014 by mickburton2. 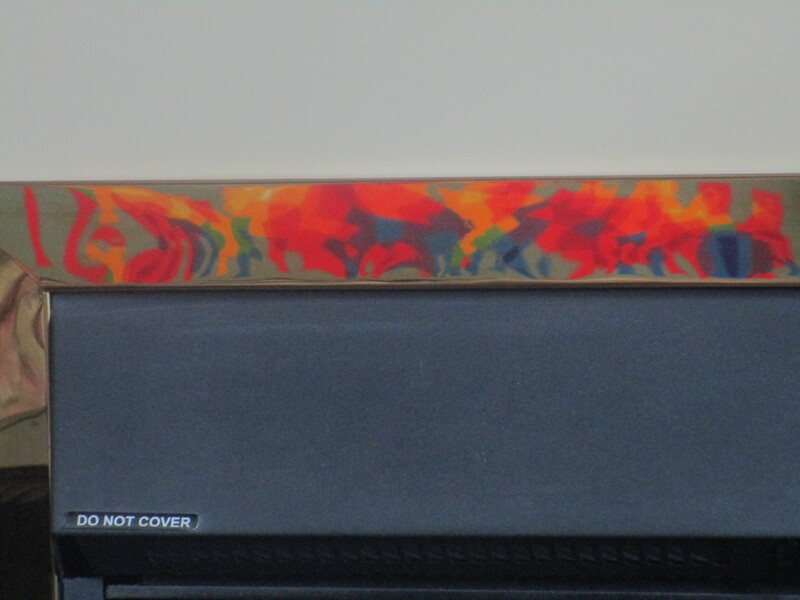 Animals in My Art – How I Started. 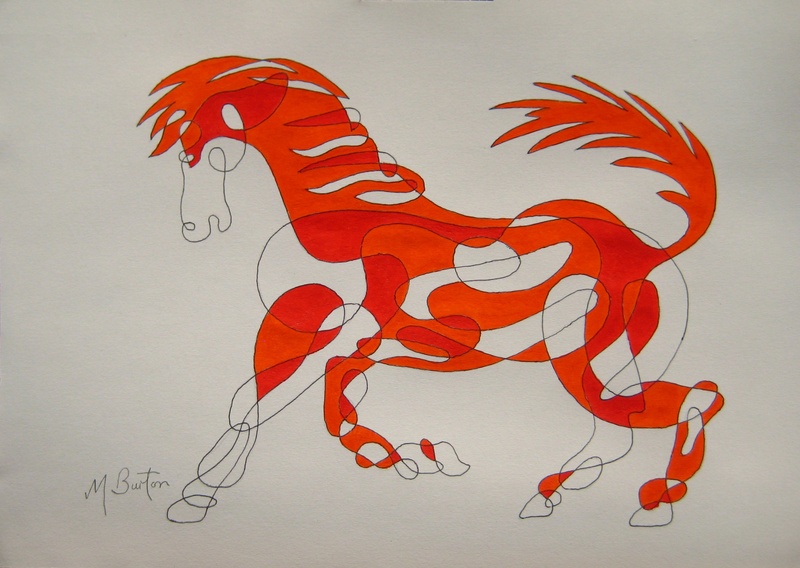 My first Animal drawn with a continuous line was the Horse, which was based upon a painting by George Stubbs, where a horse is savaged by a lion. 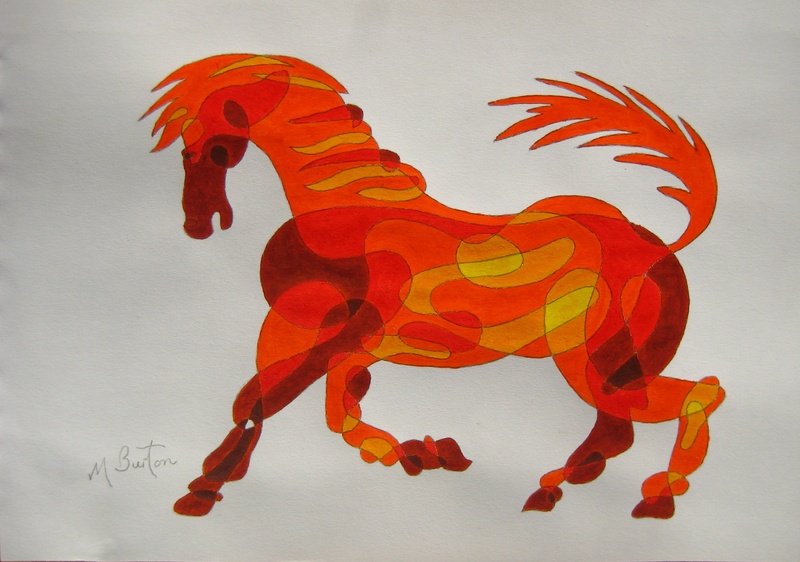 I used the general image of the horse, but with a calm and flowing style (rather than it appearing to be scared witless). The Cat was drawn quickly, in about 15 minutes, without reference to any picture. My main memories of cats in my childhood were at my Dad’s work, a market garden in Ripon where he was the foreman. There were always several cats around, which were kept to control the mice and rats in the gardens. Dad called every one “Tib”. The downside was the periodic drowning of kittens to keep the numbers in check. I particularly liked one cat which always appeared to have been in a fight, and so I drew a dislocated tail on my cat. This sort of tail became a trademark in some later animals. Following our April Fools Day party on 1 April 1966 (the day after the General Election) when I did my Harold Wilson continuous line, our next venture was a Pink Elephant party. So I was asked to do another picture. 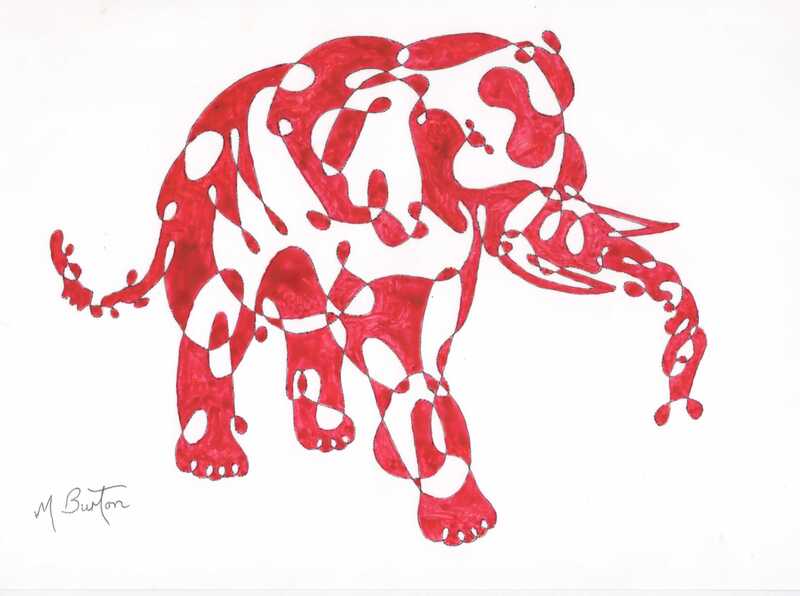 This elephant was based upon a drawing in a book of animals. I added a dislocated tail and appropriate colour. 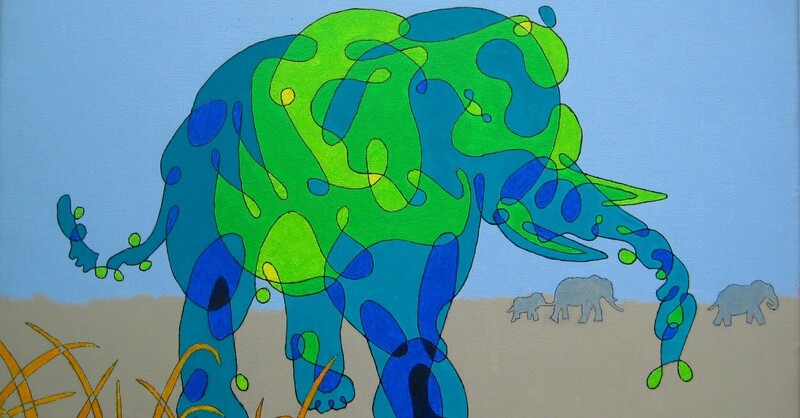 People said that the flowing lines on the Horse and the Elephant gave an appearance of elegance, whereas some animals were a bit more aggressive. 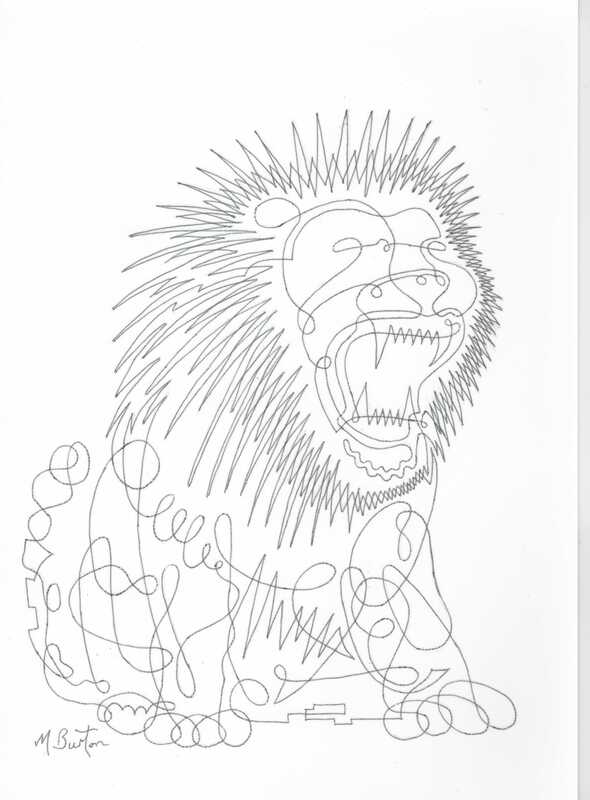 So I decided that I would draw a Lion in a seated position, with the lower part of its body at ease and relaxed, but with the head suddenly giving out a great roar. The roar was based upon the opening sequence of Metro Goldwyn Mayer films, where the lion roars through a gap in the logo. 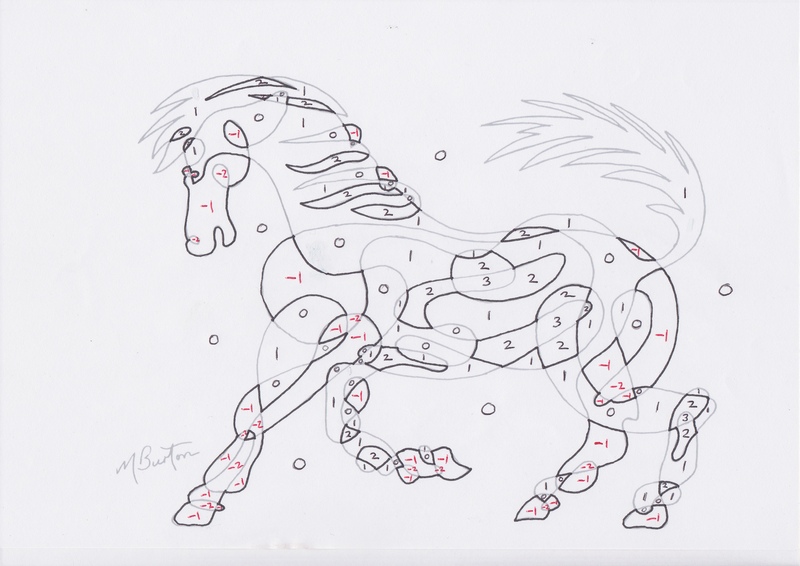 I have a strong memory of sitting with a blank piece of paper in front of me and thinking that I had done the Horse, Cat and Elephant and they had all turned out well. I had not yet failed to create a picture better than I had anticipated. Would the Lion work out ? You just have to start and see what happens. 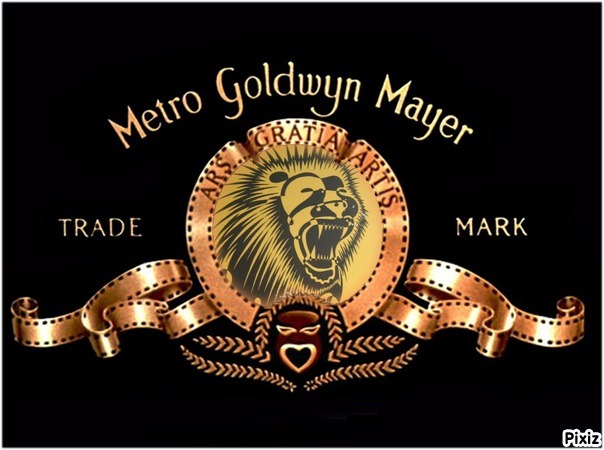 On the Internet, a couple of years ago, I saw a feature which allowed you to put your own face in the Metro Goldwyn Mayer logo. Of course I chose to put my Lion’s head in there. Their Lion was called Leo, but I prefer Mayer. 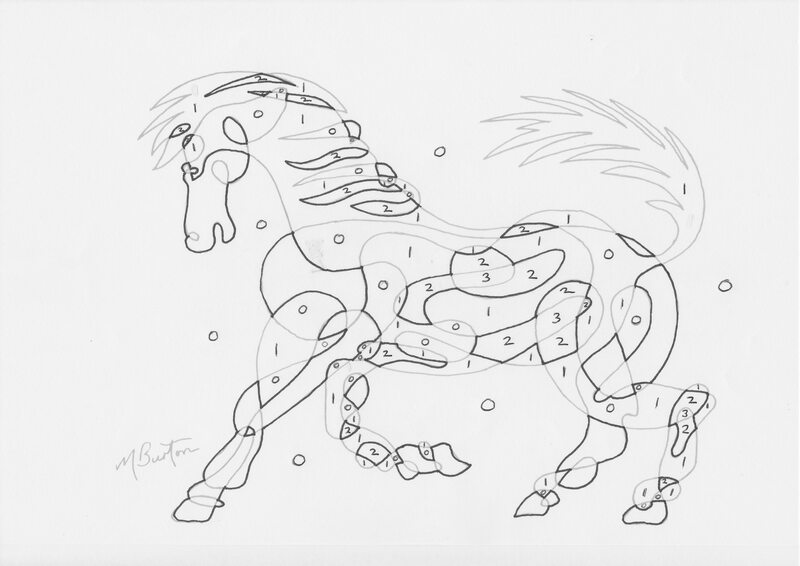 This entry was posted in Animals, My Styles of Drawing and Colouring and tagged Continuous Line, Continuous line drawing, George Stubbs, Horse, mick burton leeds artist, Mick Burton Yorkshire artist, Single continuous line drawing on April 16, 2014 by mickburton2.